Tonight we assembled yet again on Drogheda’s Bridge of Peace where once more we sighed with exasperation at the British treatment of the ill Brendan Lillis. To the extent that the British move at all it is invariably sideways. In dealing with prisoners their attitude has always been one of ‘as late as, as little as.’ Our numbers were fewer this week but the weather helps explain that. 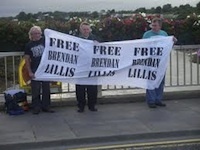 If Brendan Lillis is not free this time next week we shall be on the bridge again, our numbers increased. The British micro minister David Ford should either piss or get off the pot. If he has no power then he should do the honourable thing and resign. He should do so for his human dignity alone, rather than continue with the charade of being minister for justice in a situation where justice is viewed like some strange tropical disease. Quarantine it, poke it, dissect it, discuss it but under no circumstances allow it inside the building. A man of his intellect should not allow it to be demeaned by having it function as a rubber stamp for the power behind the throne. Yesterday, Brendan Lillis was moved to an outside hospital. As part of the long running farce, he is being held under armed guard so that David Ford can maintain the pretence of some threat posed. Roisin Lynch, the ill man’s partner succinctly summed matters up: ‘this is the last thing that Ford would want because he now looks like he has egg on his face.’ Earlier Ford’s executive colleague Martin McGuinness said ‘it is abundantly clear that Brendan Lillis is seriously ill and should be released immediately to secure the necessary medical care that is required.’ What impact this may have had is unclear but in recent days Sinn Fein have turned up the volume around the issue. Tonight, standing on the bridge with another former lifer, putting the effort in on behalf of this ill man who had his licence revoked, my thoughts drifted to those former republican prisoners who shamefully erased ‘Free Marian Price’ slogans in North Belfast. Price too had her licence revoked. Why aren’t they standing on bridges reminding people of British maltreatment of prisoners rather than seeking to obliterate prisoners’ names from public view? In spite of their activity the numbers of shoulders at the wheel are increasing and are turning things around. It is slow and exasperating, always more to sigh about than cheer. But Brendan Lillis is now getting treatment he had no chance of getting in Maghaberry. Ford cannot act with impunity. Former republican prisoners have a power that cannot be erased by a scab with a paintbrush.